NOT ENDED YET; BUT PRETTY INTERESTING. DID SOMEONE SAY, "EDDIE FARRELL"? I'VE NEVER SEEN THIS RUTH MODEL BEFORE. MAKES SENSE THAT IT WOULD COME TO THIS. REALLY NICE LOOKING GLOVE (ENDS TOMORROW, FEB.6TH) ! The KenWel glove is one of the nicer model 560's to show up. The Ruth glove with the "Eddie Farrell" style web will bring out a lot of bidders. The webbing is really unique. A collector got a pretty nice base mitt for $81 on ebay. It is a Simmons American brand with high grade blond leather and in super shape despite being dried out. This one could look a lot better with a little TLC. A rare Stall & Dean Buckle web catchers mitt sold for $142 on ebay. Everything looks intact and should benefit with a little cleaning and conditioning. I love the guitar shaped wrist straps. Pretty ballsy to set your price early and not get into last second sniping. It worked out and the Spalding Ruth went for $1237. This Victor Wright Ditson model DP Del Prat sold at $158.50. Very high quality glove with interesting web. This Wilson "Carl Hubbell" model 600 sold for $228 on ebay. If your looking for a "Hubbell" glove for your collection, the model 600 is the one. May be why the price got up there. This is a big glove and was Wilson's top glove in the day. It is stamped "Professional Pitchers Model" lightly in the pocket. This would have been a triple tunnel model but is missing two of the tunnel webs. A 1930's D&M "Gus Suhr" model base mitt sold for $239 on ebay. D&M's top base mitt features a finger guard and lacing for cinching up the thumb and pinky. Nice looking mitt with the later style D&M patch on the back. Another "lefty" glove, this one a possible Higgins brand "Jesse Haines" model 1669 sold for $278 on ebay. A rare 3 finger model. A 1930's D&M "Wally Berger" model G43 glove sold for $218 on ebay. Glove features the "No-Rip Thumb" patented one piece palm. Interesting to see that in a D&M glove. I wonder if D&M initiated the patent or Goldsmith. Would have been about 1934. Really stylish buckle back design and glove in overall good condition. A 1950's MacGregor "Red Schoendienst" model GC1 sold for an undisclosed "best offer" on ebay and I think was a pretty good deal. The buyer is a memorabilia dealer so I'm sure this one will be back on ebay shortly. Schoendienst was a major endorser for MacGregor through the years. I know of three different variations of the GC1 model. This is a big glove and was one of their top models and expensive in its day so not often seen at auction. It is in super condition. Got to love the "Spider Web". Two vintage catchers mitts in excellent condition won by the same buyer. The second mitt is also a Reach, this one a buckle web model 200 that sold for $275. A Wilson "Red Ruffing" model 623 sold for $381 on ebay. Stamped "Three Finger Model" above "Chas. Ruffing" in the pocket. Glove is in pretty good shape and a popular style for collectors. An early sewn web Horace Partridge model 18K glove sold for $306 on ebay. Glove has been discussed earlier and not presented well with the scanned image. Based on better pictures from an earlier Legendary Auction, the glove is a knockout. Great cloth patch and strong markings in the pocket. 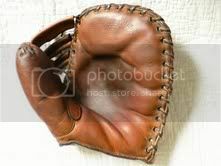 A Stall & Dean buckle web "Stuffy McInnis" model base mitt sold for $125 on ebay. Mitt not well described or photographed in the listing. A few from Hunts recent auction. prices not including the 15% buyers premium.